March 2009 Presentation of the book “Just care- Africa” featuring photographs of Marina Shacola and Andreas Vasiliou, for the sponsors and friends of the Foundation at the central offices of the Bank of Cyprus. Arpil 2009 Photo exhibition “Just care”, by Marina Shacola and Andreas Vasiliou,and screening of the documentary “Just care”, filmed by Andreas Vasiliou, at the Budapest City Hall. July 2009 First official Medical Mission to Kenya. September 2009 Photo Exhibition and screening of the documentary “Just Care”, at the European Parliament in Brussels, following an invitation by the Health Commissioner of the European Union Mrs. Androulla Vassiliou. October 2009 Photo exhibition, screening of the documentary «Just Care» filmed by Andreas Vassiliou, and bazaar with African art objects at Omicron gallery in Nicosia. The opening ceremony was officiated by the President of Cyprus Demetris Christofias and all proceeds from the sale of photographs and objects, went towards the building of the ‘Makarios Children’s Home’ in Kenya. October 2009 Presentation of the Poetry Collection by Marios Taramides “Moments”(poems and photos from trips of the poet abroad), at “Fresh”, in Nicosia. The net proceeds from the sale of the poetry collection were donated for the reconstruction of the Makarios Children’s Home’. October 2009 Sophia starts a five year support program for medication and food for the Children’s Oncology Department at the Kenyatta Hospital in Nairobi. November 2009 Terpsichoria, the music club of the University of Cyprus hosted a concert with the group “Trimitonio” and also a photo exhibition “Just Care”, by Marina Shacola and Andreas Vasiliou. All proceeds from the concert were donated to the “Sophia Foundation for Children”. December 2009 “Charity Festival and Bazaar”, held by the Nicosia University. All proceeds were donated for the reconstruction and extension of the “Makarios Children’s Home”. December 2009 Cyprus Medical Mission to Kenya. January 2009 “A streetcar named Desire’ by Tennessee Williams performed by the Theatre group “Ena”, and the proceeds donated to the “Sophia Foundation for children”. March 2010 Medical Mission in collaboration with the Dutch Organisation MCC. April 2010 Photo exhibition featuring photos by Demetris Vattis and the net proceeds were donated to the “Sophia Foundation for Children”. May 2010 Photo exhibition at the “Sophia Foundation” kiosk at the Cyprus State Fair, and screening of the second documentary of the Foundation “A Story to Tell” filmed by Andreas Vassiliou. August 2010 Mission to Kenya. 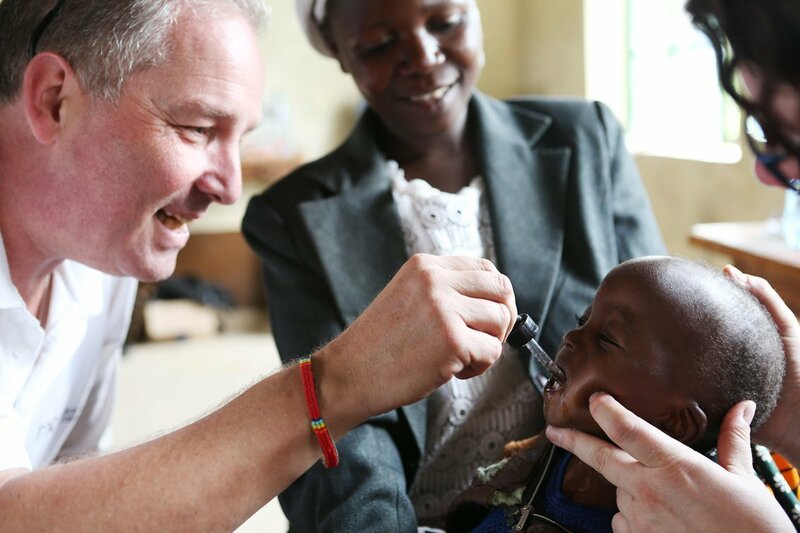 Offering medical care to sick children and starting a vaccination program for all children at the ‘Makarios Children’s Home’ and at the St ‘George pre-school in Kibera. Provide clothing to children in our schools in Western Kenya. Construction of a playground, as well as providing individual and group toys. Supply of sheets and blankets. Continuation and promotion of all enterprises for the renovation and expansion of the Orphanage. December 2010 Photo exhibition “Just Care”, featuring photos taken by Marina Shacola and Andreas Vassiliou, at the cultural centre in Polis Chrysochous, Paphos. December 2010 Presentation of the book “Utopia”, written by the journalist Elita Michaelidou. Part of the proceeds were donated to the “Sophia Foundation for Children”. 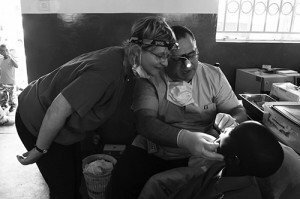 December 2010 Dental Mission under the leadership of Dr. Marios Taramides. December 2010 Launch of the “Mikromagazo” ( our little African bazaar) selling handicrafts made in Kenya at the Mall of Cyprus. February 2011 Award Ceremony by the University of Cyprus. At this ceremony the “Sophia Foundation for Children” received the award for ‘Major contribution to Society and Culture’. February 2011 Two Performances by Stamatis Kraounakis’ at the Palace Municipal Hall, in Nicosia. All proceeds were given for the reconstruction and extension of the “Makarios Children’s Home”. March 2011 Anna Vissi visits Kenya together with volunteers of the “Sophia Foundation for children” and joins their efforts to help children in need. March 2011 Medical Mission in collaboration with the Dutch Organisation MCC. April 2011 Anna Vissi performs ‘Unplugged” at Strovolos Municipal Theatre. 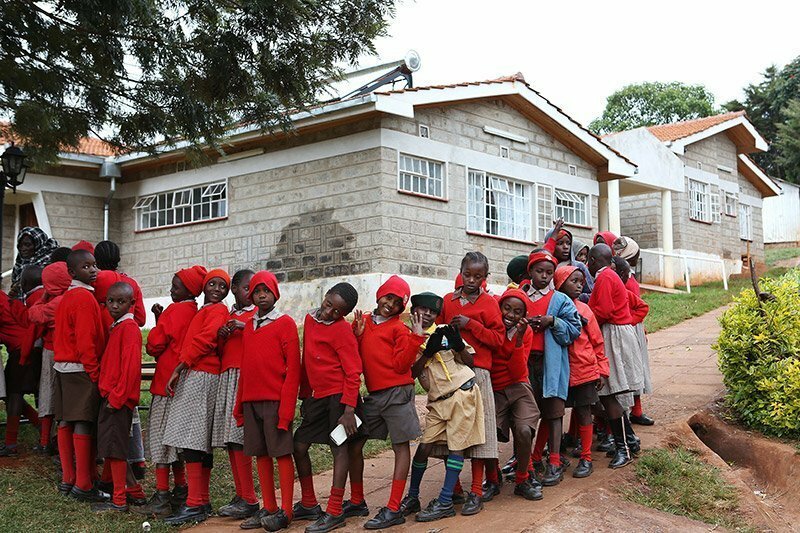 All proceeds were given to the reconstruction of the new premises of the ” Makarios Children’s Home”in Kenya. June 2011 Concert by Stamatis Kraounakis at the Courium Amphitheatre in Limassol. All proceeds were given for the reconstruction and extension of the “Makarios Children’s Home”. July 2011 An exploratory mission in the remote area of Turkana, Kenya. October 2011 Beginning of the Education program ‘Just Care’ in Primary and Secondary schools in Cyprus. February 2012 Filming the third documentary “Imagine”. March 2012 The fifth episode of Anna Vissi’s rockumentary “As long as I have a voice”, dedicated to the Kenyan orphans and the activities of the “Sophia Foundation for Children”. June 2012 Exhibition and auction at Omikron Gallery, under the title “A bag-a child-a life”. Myrna Pattichi and the newspaper “ Phileleftheros”, joins forces with the “Sophia Foundation”. 128 kiondo baskets from Kenya were given to artists and personalities from Cyprus and Greece, who turned them either into bags or other items for everyday uses. All proceeds were donated to the “Makarios Children’s Home”. June 2012 Construction of the first water well for pumping clean water in the desert of Turkana. July 2012 Liana Toumazou, general director of RICS Cyprus and Greece, climbs Kilimanjaro, the highest mountain in Africa (5,895 m) on June 25, 2012 in the effort to raise money in support of the ” Makarios Children’s Home” in Kenya. January 2013 The inauguration of the programme “Food for Food” involving restaurants, coffee shops and hotels throughout Cyprus for the support of Sophia Foundation for Children, by voluntarily billing an extra amount of 0,01 up to 1 euro on every order taken. February 2013 The theatre plays “The God of Massacre” and “Elephant Man” were performed for the “Sophia Foundation for Children”. The net proceeds from the stage performances were donated to Foundation. February 2013 International distinction for the short film “Just Care” in the International contest EACA-Care Awards. The one minute version of the film, was created and submitted by Partners YR and won its free broadcast by “Euronews”, during the show “One Minute of Responsibility”. June 2013 Medical Mission in collaboration with the Dutch Organisation MCC. 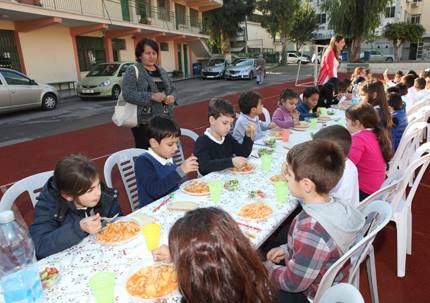 September 2013 The programme “I cook and I offer” for all-day public primary schools in Cyprus starts to be implemented. The “Sophia Foundation for Children” constructs and equips kitchens at schools, employs unemployed mothers from the immediate community and offers lunch indiscriminately to all the school children. October 2013 “Chain of Love” a fundraising event organized by the University of Cyprus Volunteer club, for Children in Cyprus and Kenya. Symbolically 4,053 paper hearts (the miles between Cyprus and Kenya), joined to create the largest chain of love. Part of the proceeds was given to Sophia Foundation for Children. December 2013 “The arrow of Hope” an exhibition and auction at the Omikron Gallery, organised by Myrna Pattichi and “Phileleftheros”newspaper. The event involved 200 personalities and artists from Cyprus and Greece, who created their own pashminas. All proceeds went to the “Sophia Foundation” for the program “I Cook and I offer”. March 2014 The Levention Municipal Museum supports the “Sophia Foundation for Children” by making and selling traditional kites. March 2014 U4 Kenya-The first presentation of the “Sophia Foundation for Children” in Athens. March 2014 A Medical Mission in collaboration with the Dutch Organisation MCC takes place in Kenya. April 2014 Dental mission with dentists from Cyprus under the leadership of Dr. Eleni Kapsou in collaboration with Christianna Constantinou and Loucas Michael. June 2014 The Cyprus tv channel Mega, hands a check of 120,000 euros to the Sophia Foundation for children, which was collected from its four month weekly talent programme ‘your song’. July 2014 Mission to Kenya. Let’s go green! With this slogan the volunteers of the Sophia Foundation for Children planted fruit trees and vegetables in the garden of the ‘ Makarios children’s home’ in Kenya. The children were thrilled and participated with great enthusiasm. 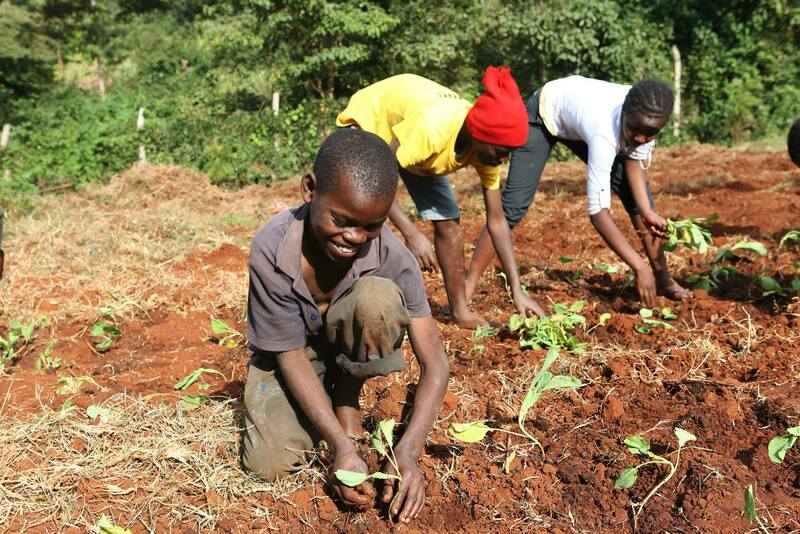 More than 3,500 vegetables were planted and now our orchard has more than 30 fruit trees. September 2014 Α delegation of the Dutch medical MCC organization visits Cyprus. Signing of agreement for renewal of the long cooperation between MCC and Sophia Foundation for Children. Our volunteers have implemented training programs of the Organization WHO (World Health Organisation) to teachers and the staff of the Makarios Orphanage, related to virus Ebola countermeasures, in case of an outbreak in Kenya. Six new taps with running water were installed in the school whereas clothes and toys were given to all children. 2014 Bank of Cyprus announces a donation of EUR 1000.000 million for the support of our program ‘I Cook and I offer’. The Bank undertakes the creation of the kitchen and equipment as well as the operating costs in 8 all day primary schools. Sophia Foundation for Children has the responsibility of the whole operation. 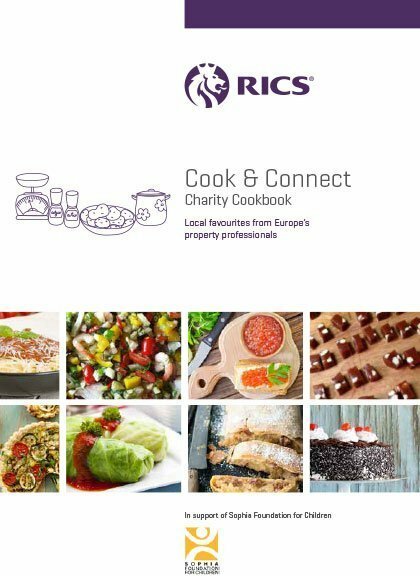 2014 RICS property professionals from around Europe have come together to share their culinary skills with exclusive tried and tested home cooking. 100% proceeds of Cook & Connect is donated to the Sophia Foundation for Children. 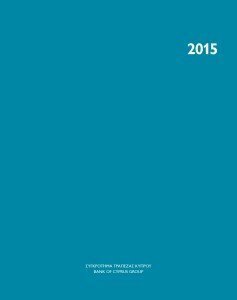 2014 The 2015 calendar of the Bank of Cyprus is issued and dedicated to our programme ‘ I Cook and I offer’.